"No means no for Elmo!" Elmo is a kids TV show character. Big Bird, Oscar the Grouch, and him were part of the crowd chasing Homer. In the DVD commentary, he was named Elmaux due to legal reasons. Maggie also has a tickle-me toy of Elmo that Moe and Maggie tickled too much so it slapped Moe. He was a prisoner at the Ronald Reagan Reeducation Center. He was wrongly imprisoned there because he went to the wrong fund raiser. 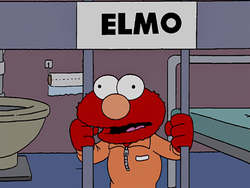 Elmo couldn't take prison life there so eventually committed suicide by hanging himself. Ralph also once said that he was playing with Elmo, which was actually a rat. When Ned walked in on Homer and his parents Ned, Sr. and Mona watching Sesame Street and smoking marijuana, Big Bird and Elmo were on the screen. Elmo is a character from Sesame Street. Modified on July 18, 2018, at 18:48.